"I can easily say this is one of the best FET mics I've heard to date." "On playback of the first takes, I was stopped in my tracks, staring at the speakers..."
"The V57 is one sweet sounding circuit, up there with the best!" "MXL 910 with RK-7 [and MP-V57 kit] assembled and tested. Sounds great!! Thick and warm, all sibilances gone. Very excited! Thanks for great product!" 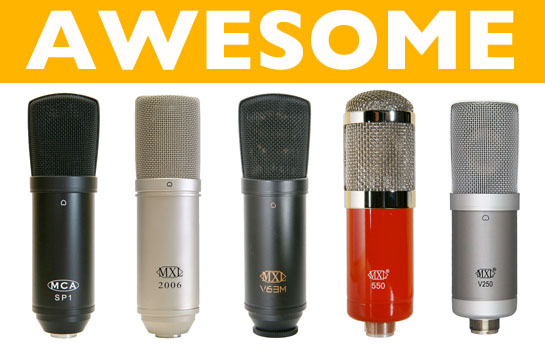 All of MXL's transformerless microphones are wonderful candidates for an upgrade. We've developed a mod kit that turns these mics into high sensitivity, low noise, multipattern microphones. Just follow these two easy steps. Step 1 is to replace the stock circuit with our "MP-V57" PCB kit. The kit includes a high-quality two-layer PCB (made in the USA), and handpicked audiophile-grade components. You just need to solder it all together. Step 2 is to pick from any of our six large-diaphragm capsules. We have so many choices because they all sound different. This is the best way to build some sonic variety into your mic locker!